Laos (( i/ˈlaʊs/, /ˈlɑː.ɒs/, /ˈlɑː.oʊs/, or /ˈleɪ.ɒs/) Lao Language: ສາທາລະນະລັດ ປະຊາທິປະໄຕ ປະຊາຊົນລາວ,pronounced [sǎː.tʰáː.laʔ.naʔ.lat páʔ.sáː.tʰiʔ.páʔ.tàj páʔ.sáː.són.láːw] Sathalanalat Paxathipatai Paxaxon Lao), officially theLao People's Democratic Republic (LPDR) (French: République démocratique populaire lao), is a landlocked countryin Southeast Asia, bordered by Burma and the People's Republic of China to the northwest, Vietnam to the east,Cambodia to the south, and Thailand to the west. Since 1975, it has been ruled by a Marxist and communistgovernment. Its population was estimated to be around 6.8 million in July 2014. Laos traces its history to the kingdom of Lan Xang, which existed from the 14th to the 18th century when it split into three kingdoms. In 1893, it became a French protectorate, with the three kingdoms — Luang Phrabang, Vientiane andChampasak — uniting to form what is now known as Laos. It briefly gained independence in 1945 after Japanese occupation, but returned to French rule until it was granted autonomy in 1949. Laos became independent in 1953, with a constitutional monarchy under Sisavang Vong. Shortly after independence, a long civil war ended the monarchy, when the Communist Pathet Lao movement came to power in 1975. Laos is a single-party socialist republic. It espouses Marxism and is governed by a single party communist politburodominated by military generals. The Socialist Republic of Vietnam and the Vietnam People's Army continue to have significant influence in Laos. The capital city is Vientiane. Other large cities include Luang Prabang, Savannakhet, andPakse. The official language is Lao. Laos is a multi-ethnic country with the politically and culturally dominant Lao peoplemaking up approximately 60% of the population, mostly in the lowlands. Mon-Khmer groups, the Hmong, and other indigenous hill tribes, accounting for 40% of the population, live in the foothills and mountains. It is a member of the Asia-Pacific Trade Agreement (APTA), Association of Southeast Asian Nations (ASEAN), East Asia Summit and La Francophonie. Laos applied for membership of the World Trade Organization (WTO) in 1997; on 2 February 2013, it was granted full membership. According to the anti-corruption non-governmental organization Transparency International, Laos remains one of the most corrupt countries in the world. This has deterred foreign investment and created major problems with the rule of law, including the nation's ability to enforce contract and business regulation. This has contributed to a third of the population of Laos currently living below the international poverty line (living on less than US$1.25 per day). Laos has a low-income economy, with one of the lowest annual incomes in the world. In 2013, Laos ranked in 138th place (tied with Cambodia) on the Human Development Index (HDI), indicating that Laos has lower medium to low development. 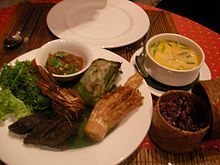 According to the Global Hunger Index (2013), Laos ranks as the 25th hungriest nation in the world out of the list of the 56 nations with the worst hunger situation(s). Laos has had a poor human rights record most particularly dealing with the nation's acts of genocide being committed towards its Hmong population. Laos is the only landlocked country in Southeast Asia, and it lies mostly between latitudes 14° and 23°N (a small area is south of 14°), and longitudes 100° and 108°E. Its thickly forested landscape consists mostly of rugged mountains, the highest of which is Phou Bia at 2,818 metres (9,245 ft), with some plains and plateaus. The Mekong River forms a large part of the western boundary with Thailand, whereas the mountains of the Annamite Range form most of the eastern border with Vietnam and the Luang Prabang Range the northwestern border with the Thai highlands. There are two plateaux, theXiangkhoang in the north and the Bolaven Plateau at the southern end. The climate is tropical and influenced by themonsoon pattern. Through the development, release and widespread adoption of improved rice varieties, and through economic reforms, production has increased by an annual rate of 5% between 1990 and 2005, and Lao PDR achieved a net balance of rice imports and exports for the first time in 1999. Lao PDR may have the greatest number of rice varieties in the Greater Mekong Subregion. Since 1995 the Lao government has been working with theInternational Rice Research Institute of the Philippines to collect seed samples of each of the thousands of rice varieties found in Laos. View from near the sanctuary on the main upper level of Wat Phu, looking back towards the Mekong River. The tourism sector has grown rapidly, from 80,000 international visitors in 1990, to 1.876 million in 2010.Tourism is expected to contribute US$679.1 million to gross national product in 2010, rising to US$1.5857 billion by 2020. In 2010, one in every 10.9 jobs was in the tourism sector. Export earnings from international visitors and tourism goods are expected to generate 15.5% of total exports or US$270.3 million in 2010, growing in nominal terms to US$484.2 million (12.5% of total) in 2020. The official tourism slogan is "Simply Beautiful". The main attractions for tourists include Buddhist culture and colonial architecture in Luang Prabang; gastronomy and ancient temples in the capital of Vientiane; backpacking in Muang Ngoi Neua and Vang Vieng; ancient and modern culture and history in The Plain of Jarsregion (main article: Phonsavan); Laos Civil War history in Sam Neua; trekking and visiting hill tribes in a number of areas including Phongsaly and Luang Namtha; spotting tigers and other wildlife in Nam Et-Phou Louey; caves and waterfalls near Thakhek; relaxation, the Irrawaddy dolphin and Khone Phapheng Falls at Si Phan Don or, as they are known in English, the Four Thousand Islands; Wat Phu, an ancient Khmer temple complex; and the Bolaven Plateau for waterfalls and coffee. The European Council on Trade and Tourism awarded the country the "World Best Tourist Destination" designation for 2013 for this combination of architecture and history. Laos is known for its silk and local handicraft product, both of which are on display in Luang Prabang's night market, among other places. Another speciality ismulberry tea. Theravada Buddhism is a dominant influence in Lao culture. It is reflected throughout the country from language to the temple and in art, literature, performing arts, etc. Many elements of Lao culture predate Buddhism, however. For example, Laotian music is dominated by its national instrument, the khaen, a type of bamboo pipe that has prehistoric origins. The khaen traditionally accompanied the singer in lam, the dominant style of folk music. Among the lam styles, the lam saravaneis probably the most popular.